Huawei, which is a private company wholly owned by its employees, reported 2018 revenue of CNY721,202 million, representing an increase of 19.5% year-on-year. Net profit grew by 25.1% year-on-year to CNY59,345 million. To increase transparency of its operations, Huawei published a 157-page annual report in English that provides an unprecedented look into the workings for the company. Huawei earned CNY372,162 million in revenue from the Chinese market, up 19.1% year-on-year. Smart phone sales were the hottest growth area. 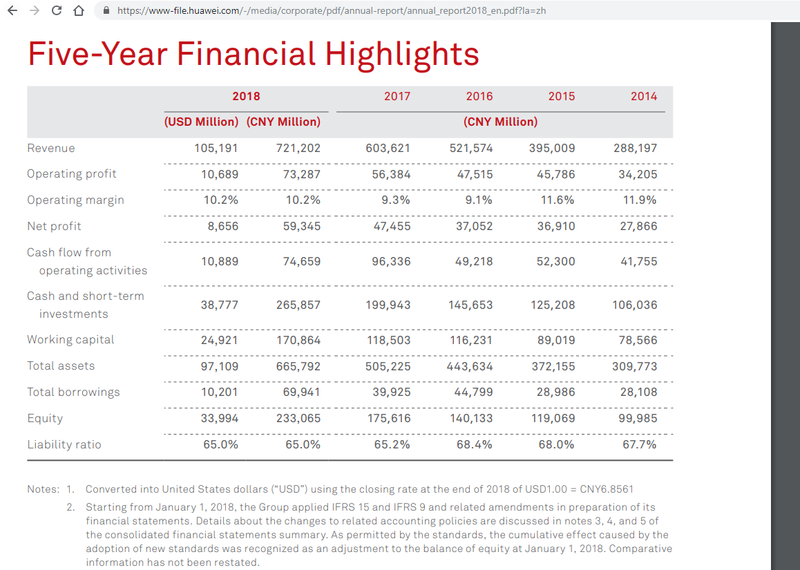 Huawei’s revenue from the Americas grew to CNY47,885 million, up 21.3% from 2017. Huawei's consumer business generated revenue of CNY348,852 million, a year-on-year increase of 45.1%. As of the end of February, Huawei had 30 contracts for 5G. As of the end of February, Huawei had shipped more than 40,000 5G base stations to markets around the world. More than 50 carriers around the world, including Vodafone, Telefónica, China Mobile, China Unicom, and China Telecom, have partnered with Huawei on 5G commercial tests. Huawei’s 10G PON solutions have been deployed commercially by more than 30 leading carriers. Huawei's Optical Distribution Network (ODN) has been deployed by more than 80 carriers. Huawei has helped carriers roll out 53 NBIoT networks and 16 eMTC networks. Huawei's WTTx wireless broadband has been deployed in more than 180 networks, connecting more than 40 million home users, including over a million households in the Philippines, South Africa, and Japan. Huawei’s CloudFabric solution had been commercially deployed in more than 1,200 data centers in more than 120 countries. Huawei's VoLTE solution is in commercial use in more than 50 network, serving more than 300 million users. Huawei has helped more than 160 cities in over 40 countries and regions implement smart city projects. As of December 31, 2018, the total number of patents granted to Huawei reached 87,805. About half of the patents are in China and the rest abroad. R&D expenditure totaled CNY101,509 million in 2018, accounting for 14.1% of the company’s total revenue. Browser. More than 150 million photos are uploaded to HUAWEI Mobile Cloud every day. The HUAWEI AppGallery had more than 120 billion downloads throughout the year. and membership cards became available. Huawei Pay also became the first payment service provider to support China’s eID on mobile phones. KPMG served as independent auditors on the report. 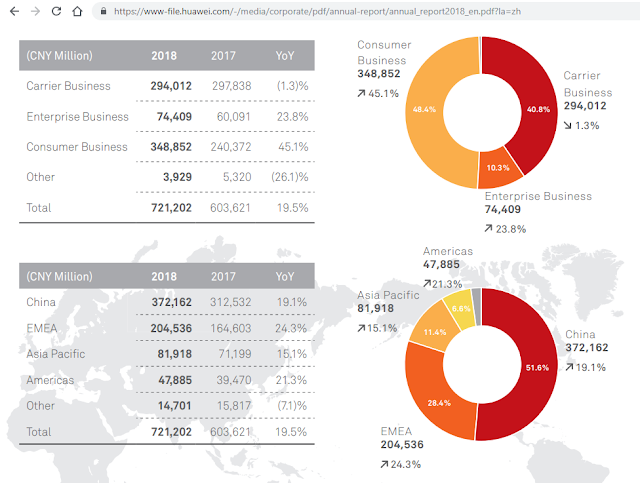 Huawei’s Global Industry Vision (GIV) predicts that the percentage of global population living in areas covered by 5G networks will reach 58% by 2025. The amount of global data generated and stored annually, including data copied, will reach 180 zettabytes in 2025, a 20-fold increase of the current amount. Huawei predicts that by 2025, the global AI market will be worth US$380 billion, 90% of which will come from the enterprise market. companies will be using AI, and data utilization will skyrocket to around 80%. A 5G Arena at this week's Hannover Messe 2019 is described as "the world's first industrial 5G campus network of this scale and diversity." The network is supported by Deutsche Telekom, Nokia and Qualcomm. "The smart, connected factories of the future will not only be able to make things, but make decisions too. We are very proud to support these live over-the-air demos with Nokia and European industry players to what 5G will make possible for industrial IoT," said Enrico Salvatori, senior vice president & president, Qualcomm EMEA, Qualcomm Europe, Inc. "Qualcomm Technologies has been a key enabler in the industrial IoT for years, and we look forward, with 5G, to continuing to make Industry 4.0 a reality in Europe and around the world." "The fourth industrial revolution promises massive gains in productivity, disruptive customer experiences, and new business models," said Kathrin Buvac, President of Nokia Enterprise and Chief Strategy Officer. "Next generation networks, including 5G, will enable this industrial transformation and beyond with network reliability, capacity and low-latency features. We are delighted to work with Deutsche Messe AG and Qualcomm Technologies to bring industrial use-cases to the 5G Arena including intelligent factories, where workers are safer, equipment is smarter, and efficiencies are higher." 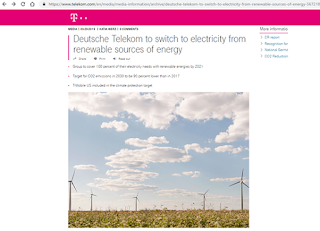 Deutsche Telekom announced a new, ambitious climate target: the Group is aiming to achieve a 100 percent use of electricity from renewable energy sources as early as 2021. Deutsche Telekom also vowed to reduce other emissions from gas, oil, and other sources of energy. By 2030, the Group aims to reduce CO2 emissions by 90 percent compared to 2017. “We want to build the future, not obstruct it”, says Tim Höttges, CEO Deutsche Telekom. “Climate protection is one of the key challenges of our age. With the new targets for the period 2021-2030, we are taking our responsibility seriously and are acting decisively, quickly and, at the same time, in a sustainable manner. 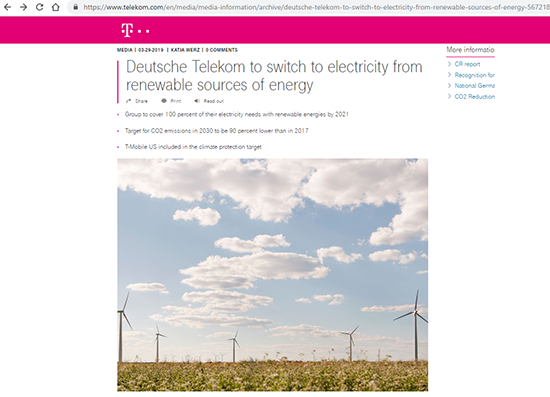 Furthermore, this sends an important signal to our customers because sustainability is becoming increasingly important as a purchasing criterion,” stated Tim Höttges, CEO Deutsche Telekom. Nokia celebrated its 30th commercial 5G deal: Austria's A1. Nokia said, taken together, the 30 commercial deals - including 16 with publicly named service provider customers - offer an insight into the progress of 5G roll-outs around the world and illustrate the value network operators see in this technology. "This achievement marks a proud moment for Nokia as a company," commented Rajeev Suri, President and Chief Executive Officer of Nokia. "With these agreements, creating new partnerships and continuing existing relationships around the world, we can see the promise of 5G becoming a reality. Many of the 30 commercial 5G deals we celebrate today include multiple elements from across our end-to-end portfolio as our customers turn to Nokia at each stage of their 5G investment cycle." Saudi Telecom Company (STC) announced Multi-Vendor-Integration-Verification (MVIV) for its Huawei and Cisco core infrastructure with Ericsson and Nokia supplied 5G Radio Networks. STC plans to a diverse 5G deployment through joint innovation with the goal of providing "the best “Ultra High Speed & Low Latency” experience for its customers. Following its 5G launch in 2018, STC and its global partners have continued to conduct joint interoperability tests to ensure seamless interworking between all elements of STC infrastructure. Eng. Khaled I. Al Dharrab, Infrastructure Sector VP, STC, said: “5G network is developing at a very high rate. STC is a leading worldwide operator with a commitment to pioneer the technological advancements and introduce new 5G services and use-cases. We have already put ourselves on the road to enable technology and shape the future of 5G services in the Kingdom. Our collaboration with our global suppliers will push forward the boundaries for our 5G ambitions. It will definitely lead to the rise of new class of services that will go far ahead in meeting our customers’ high expectations. A well-integrated 5G network with full interoperability will deliver endless possibilities and opportunities for our deserving customers. This will also facilitate the road towards meeting KSA national 2030 Vision”. Batelco has selected Ericsson for 5G deployment in its home market of Bahrain. The deal includes Ericsson's 5G New Radio (NR), mobile transport, and core. Financial terms were not disclosed. Batelco recently achieved Bahrain’s first 3GPP-compliant 5G data call on a commercial mobile network using a 5G pocket router. The call used Ericsson Radio System solutions and 5G Cloud Packet Core. Bell confirmed that it will proceed with previously announced plans to deactivate its legacy CDMA network on April 30th. Customers in remaining CDMA coverage areas in Manitoba, Ontario, Québec and the Atlantic provinces have been notified that they will transition to Bell LTE by April 30. "Bell is proud to welcome our CDMA customers to Canada's best national mobile network. The Bell LTE network always sets the standard in wireless speed, capacity and quality and will continue to evolve as we prepare for the introduction of 5G wireless," said Stephen Howe, Bell's Chief Technology Officer. "Our Network team looks forward to leveraging efficiencies from our CDMA shutdown, including repurposing existing site structures, fibre connections and power systems, to further enhance our industry-leading LTE network." , soundproof cube for letting its customers take and make calls or browse their smartphone in peace. The first T-Mobile Phone BoothE units are being installed in NYC, Washington D.C. and Seattle. 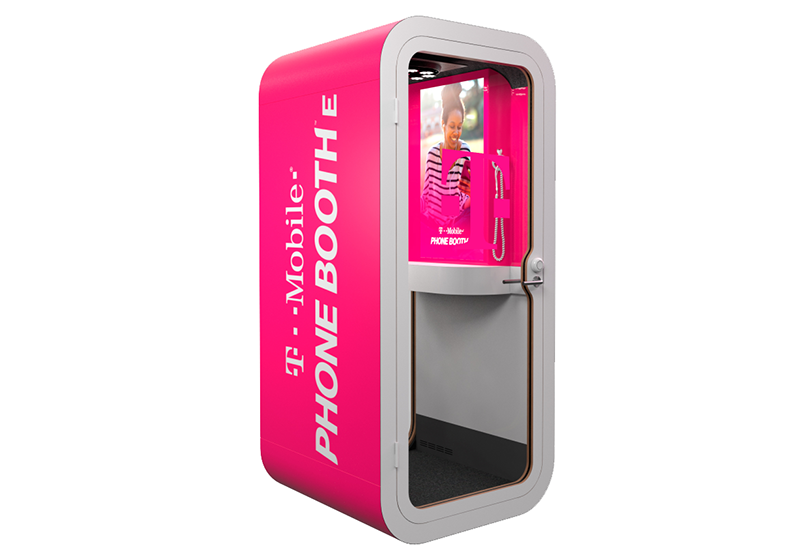 T-Mobile will be able to use an app to gain access to a booth.